Define the four varieties of product rules. Describe the difference between product rules and price rules. Pitch the value of increasing accuracy in the sales cycle. Articulate the importance of selling value versus product. CPQ product rules help ensure sales reps are putting together the right products and bundles every single time. You don’t have to worry about checking whether products and options are compatible with one another, or whether a specific SKU is appropriate for your customer’s business size and use case. We do that busy work so you can move quickly to deliver on the high expectations your customers hold for their buying experience. Increasing accuracy and customer satisfaction at the same time? That's a win-win situation if we ever saw one. Learning how different product rules function can help you understand how you can transform the way you go to market—everything from how you’re putting together SKUs or packaging products and prices to how your reps sell. There are four kinds of product rules: validation rules, selection rules, filter rules, and alert rules. Validation rules confirm that a quote’s product combinations or quote line field values match predetermined conditions. Set up rules to automatically add, remove, hide, enable, or disable options in a bundle. Prefilter the products that are available to add to a bundle. Guide and inform through messages during configuration or pricing. You can combine these product rules to improve the selling experience while increasing quote accuracy. 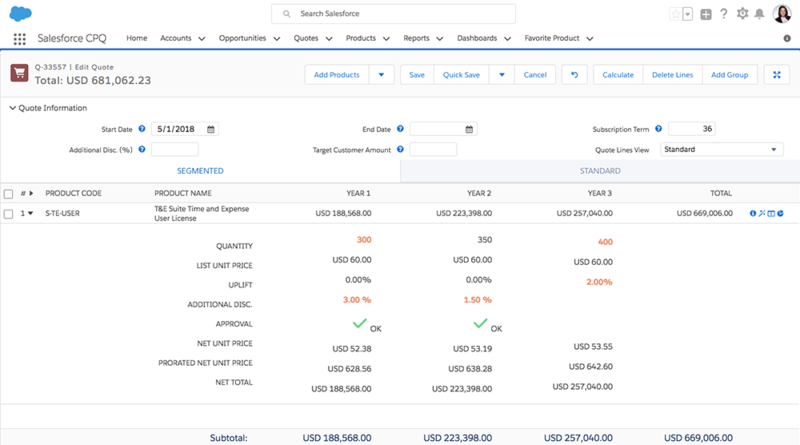 In addition to product rules, Salesforce CPQ price rules help control quoting and optimize sales. Price rules automate price calculations and update quote line fields. This feature is useful if your business contains products that change in response to the presence of other products on your quote. Price rules inject a static value, field value, or summary variable into a quote or quote line field. You can also set up price rules to target either the configurator or the calculator on the quote line editor. You can activate the price rules during quote creation by clicking Save or Calculate. Price rules will also contain price conditions. For instance, if you wanted to sell 2 ink cartridges with each printer, a price rule can ensure that if you increase the quantity of printers to 3, it will also increase the quantity of ink cartridges to 6. If you are looking for more dynamic ways to handle things like subscriptions we got you! With multi-dimensional quoting (MDQ), you can declaratively set up these line items with blocks of time (for example, days, months, years, and so on) with quantity and discounts separate from one another. You can control quantity and discounts over time without having to add new line items. Getting a quote to your customer in record time? Check! Ensuring you hit the right price? Check! Speed and accuracy are essential in the sales cycle. Reps are more productive and customers appreciate the rapid service. But dig deeper. With dynamic product and pricing rules, what you're really able to deliver is accurate value. Reps can become trusted advisors when they reflect the right market value of products and services, as well as the market value of working with a company whose people take the time to listen, respond thoughtfully, and recommend long-term solutions to critical problems. Combining the right tools with the right processes, you elevate the conversation from products and price to how your customers benefit in the long run when they do business with you.